Based in Nottinghamshire, Emma Ball is a renowned watercolour artist whose paintings can be found on all sorts of memorabilia, from gift wrap and mouse-mats, to aprons and oven mitts! 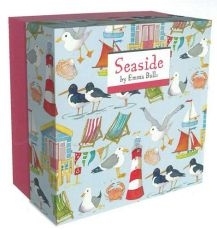 Graduating from Nottingham Trent University with a degree in Graphic Design, Emma has always had a love for watercolour and the natural beauty that can be found along British coastlines.Seaside is a 500 piece gift puzzle that is packaged in a smart compact box which measures 16.5?6.5cm the perfect gift for an avid puzzler! The box comes with a with a folded print inside.As with all Gibsons jigsaws, the beautifully illustrated pieces are made from the highest quality 100% recycled board and therefore a pleasure to work with again and again.